A schematic of the 19th century view of the plurality of worlds, all obeying the same physical laws, as envisioned in mathematical terms by Leonhard Euler based on the philosophical perspective of others, including Voltaire, who said: "The Supreme Being has created thousands of worlds, and not one resembles the other." In an astronomical context, pluralism, or the plurality of worlds, is the belief that there exist numerous other worlds harboring life and, in particular, intelligent life. The debate over pluralism extends back at least two and a half thousand years, to the time of ancient Greece, and continues vigorously today. For most of this period, a lack of hard scientific data forced the discussion entirely onto a philosophical and theological footing. Only in relatively recent times have astronomical and biological considerations come to the fore. The first strong pluralist stance was taken by the early proponents of atomism and its associated doctrines, notably Leucippus, Democritus, and Epicurus. The opposing view – that Earth is unique and that there can be no other systems of worlds – was championed by a number of other prominent Greek philosophers, including Plato and Aristotle. The possibility of lunar inhabitants was raised by Anaxagoras, Plutarch, and Lucian. It is important to recognize that "other systems of worlds" in the classical sense did not imply planets going around remote stars. As far as most Greeks were concerned, the stars of the night sky were small lights located in a vault that immediately surrounded the "sphere" of Saturn. The multitude of life-bearing worlds envisaged by the atomists was invisible and inaccessible from Earth, rather like the parallel universes of modern scientific speculation. These supposed other worlds might exist contemporaneously with the Earth (as the Stoics believed) or form a linear succession in time (as, for example, the Roman orator Cicero maintained). See ancient philosophy, related to the possibility of extraterrestrial life. Throughout the early Christian era and into the late Middle Ages, there was little discussion of the possibility of extraterrestrial life, beyond that of angels and demons. The conventional geocentric model of the cosmos, based on the teachings of Aristotle and Ptolemy, suited the Church well. Allowing, as it did, for only one Earth and therefore a privileged position for mankind, it avoided serious theological concerns to do with the incarnation and redemption which surrounded the notion that there might be intelligent corporeal life-forms elsewhere (see Christian doctrines and pluralism). Despite these concerns, however, a number of prominent scholastics eventually came to question the Ptolemaic-Aristotelian cosmos in its original form. William of Ockham, Jean Buridan, Nicole Oresme, and William Vorilong were among those who pointed out that Aristotle's insistence on the impossibility of there being more than one kosmos placed unacceptable restrictions on God's power. An omnipotent Creator, they said, must at least be credited with having had the option to make multiple worlds - a point of view officially sanctioned in 1277 by Etienne Tempier, the Bishop of Paris, acting on papal authority. With this change to the Aristotelian scheme in place, the consensus became that while God could have created other inhabited worlds, in reality He chose not to do so. But then, in 1440, Nicholas of Cusa took a bolder step by arguing that whatever lay in God's power must have been realized – a principle that has come to be known as plenitude. Following the demise of the geocentric theory at the hands of Copernicus, and the realization that the Earth is just another planet, speculation about life on other worlds, both within the Solar System and beyond, flourished. Bruno, Kepler, Campanella, Wilkins, Borel, Cyrano de Bergerac, Huygens, Fontanelle, and others, used the heliocentric world view as a logical basis for extraterrestrial speculation. For the first time, astronomical observation, made with the help of early telescopes, began to play a part in the pluralism debate. However, theological and philosophical arguments continued to hold sway. Those opposed to pluralism insisted that although the Earth may have been displaced from the center of the cosmos, humanity and its planet were still the unique focus of God's attention and love. Conversely, post-Copernican pluralists saw multiple life-bearing worlds as an expression of God's creative power and generosity. Other pro-pluralism arguments included analogy, belief in a cosmic chain of being, and teleology. By the second half of the nineteenth century, science began to play a far more decisive role in the pluralism debate, leading to a new climate of skeptical and rigorous inquiry. Bruno, Giordano Bentley, Richard Alembert, J. le Rond d' Ball, Robert S.
Democritus Borel, Pierre Barthélemy, Jean J. Bernadin S-Pierre, J.
Lomonosov, Mikhail V. Procter, Richard A. 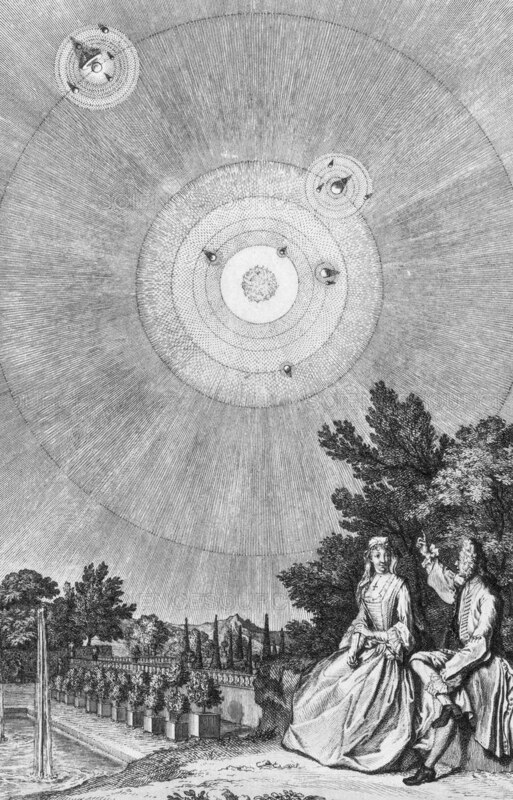 In the wake of the Copernican Revolution, it became common to argue the case for pluralism based on analogy between Earth and the other planets circling the Sun. Since those in favor of pluralism generally assumed that (a) the other worlds of the Solar System were similar to Earth, and (b) God would not have created lifeless worlds, the conclusion followed that all the solar planets supported life. By the middle of the sixteenth century, analogical reasoning had been extended to other stars which, now considered to be suns in their own right, would have been wasted had they not had their own systems of inhabited planets. At the heart of Western religious debate about the possible existence of life on other worlds are the key issues of the supposed special relationship between man and God, the incarnation and redemption. Early Christian scholars, having embraced the one-world, geocentric cosmology of Aristotle, generally rejected pluralism. This continued to be the case following the introduction into the West of many previously unavailable classical writings in the thirteenth century. However, debate did broaden at this time and there were several suggestions that while God actually created only one world, it was in his power to have produced many. Nicholas of Cusa was exceptional, as a high-ranking cleric, in speculating freely upon the possibility of multiple life-bearing worlds, including an inhabited Sun and Moon. William Vorilong was among the first to comment on how this doctrine might be compatible with a belief in Christ's sacrifice and redemption (see medieval philosophy, related to the possibility of extraterrestrial life). Following the Copernican Revolution, the debate over the theological implications of pluralism intensified. The dawning realization that the Earth was an ordinary planet and that the Sun was just one of many stars, each perhaps with its own retinue of worlds, forced philosophers, theologians, and scientists to confront the possibility that life, including intelligent life, might be common in the Universe. Some continued to reject this view, arguing that Christ's atonement and God's relationship with man were unique and, therefore, that there could be only one inhabited world. Others employed a variety of arguments designed to show that Christianity and pluralism could comfortably coexist, including the principle of plenitude; the great chain of being and the microscope argument. These efforts to enlarge the Christian cosmos resulted in the rise of natural theology and the doctrine of the transmigration of souls which reached its most extreme form in the pronouncements of Emmanuel Swedenborg. The debate climaxed in the middle of the nineteenth century, following publication of the anti-pluralist essay by William Whewell. Thereafter, theological and scientific arguments related to the possibility of extraterrestrial life became increasingly decoupled if not entirely divorced (see SETI, religious dimension). The great chain of being is a doctrine, expounded by John Locke and others, according to which there is a complete continuum of existence from the lowest life-forms to human beings to extraterrestrial creatures with intellectual and sensory powers far greater than our own. Some saw this full spectrum of life as a necessary manifestation of God's omnipotence and it was often extended to include degrees of spiritual advancement. For example, it was commonly believed that other planets might be the home of angels or similar creatures that had progressed further along the road to divinity. In some cases, this belief was linked to that of the transmigration of souls. The great chain of being was one of a number of philosophical or theological arguments put forward, from the seventeenth century onward, in support of pluralism. A concern of theologians for centuries has been that the discovery of intelligent life on other worlds might have serious implications for Christian doctrines, especially those of the incarnation and redemption. In recent times this problem has been addressed, among others, by Edward A. Milne and E. L. Mascall. The microscope argument was used originally by Thomas Chalmers in his efforts to reconcile pluralism with Christian doctrine. The argument is that just as God has created and supervises a microcosm of life in a drop of water, so he is able to care for life, not just on this Earth, but on every world in space. The available evidence strongly suggests that the origins of life should occur given the initial conditions and a billion years of evolutionary time. The origin of life on suitable planets seems built into the chemistry of the universe. Proponents of the ubiquity of extraterrestrial life and intelligence also commonly appeal to two other principles called the principle of mediocrity and the principle of uniformity. Such a concept of perfectibility linked to migration between planets offers a perspective in which the fears of inferiority, or isolation, or of being lost in a cosmos are transformed into ultimate triumph for the immortal part of man's being. It was embraced in various forms by, among others, Thomas Wright, Charles Bonnet, Immanuel Kant, Humphry Davy, Jean Reynaud, and Camille Flammarion. The vast public readership of Flammarion's writings, in particular, ensured that belief in transmigration remained in circulation until the beginning of the twentieth century. 1. Guthe, Karl S. The Last Frontier: Imagining Other Worlds from the Copernican Revolution to Modern Science Fiction. Ithaca, N.Y.: Cornell University Press (1990). 2. Lovejoy, Arthur O. The Great Chain of Being. Cambridge, Mass. : Harvard University Press (1962).